Westwood garden tractors have a worldwide reputation for their ability to cut grass superbly. However, they are designed to do so much more than just cut, stripe or mulch – the standard features that you might expect from a ride-on lawnmower. Westwood tractors are the ideal choice for performing many year-round garden chores as they are able to host a large range of attachments. These include powered attachments which use the tractor’s power take-off. Accessories are also available to help protect and extend the capability of your tractor. Designed for T and F Series garden tractors, the 120 litre transportation box is ideal for carrying logs, compost and tools. For a thicker and healthier lawn, scarify twice a year with a Westwood powered scarifier. Mounted onto the tractor it has fully adjustable height control making scarifying quick and easy. 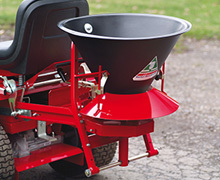 Driven by the tractor’s power take-off, the powered broadcast spreader makes short work of spreading salt or grit on paths and driveways. Mounted to the front of a Westwood tractor the snowblade quickly clears snow from a tarmac or concrete driveway. Get extra grip on slippery ground. Chevron tyres are available for T, F and V Series tractors. They are supplied on wheels ready to be fitted. Protect your Westwood garden tractor when it’s not in use with a specially designed tractor cover. Extend the use of your Westwood garden tractor with this automotive-type trailer ball hitch for easy towing.